← Australia vs India – Why can’t we get along? Everyone is back from holidays and the League of Extraordinary Gentlemen has more to say to the ACB. The Big Bash on the other hand…well that’s great…an unexpected victory for Summer Cricket when all you want is something that starts after the news and finishes around bed time. Perfect. I suspect that the ACB needs to work out how to cash in on the success of the Big Bash so that it flows over into a thriving domestic long-form and 50 over competition. The dilemma that they’re in is obvious – our fringe test players need test preparation, but the most popular thing over Summer is a T20 tournament. The other dilemma is that there is so much history associated with the Sheffield Shield that tinkering with it too much is fraught with danger. Having said that, it needs some serious tinkering, so history can … (words to the effect of ‘go jump in the lake’ – the League can get carried away sometimes). Turning it into a youth competition, as you mentioned in your article gets all the old guys out of the way, but it’s not so much an issue now, since most of the old guys are making a living from 20-20. So in reality, the Sheffield Shield might be already turning itself into a youth competition. Decentralisation of cricket is also a good thought – get it out to the country centres. But even then, there’s a bit more of a fundamental issue with Cricket – it goes too long. I’ll qualify that by saying that test matches are fine to go for 5 days, but a four day domestic comp? Seriously? 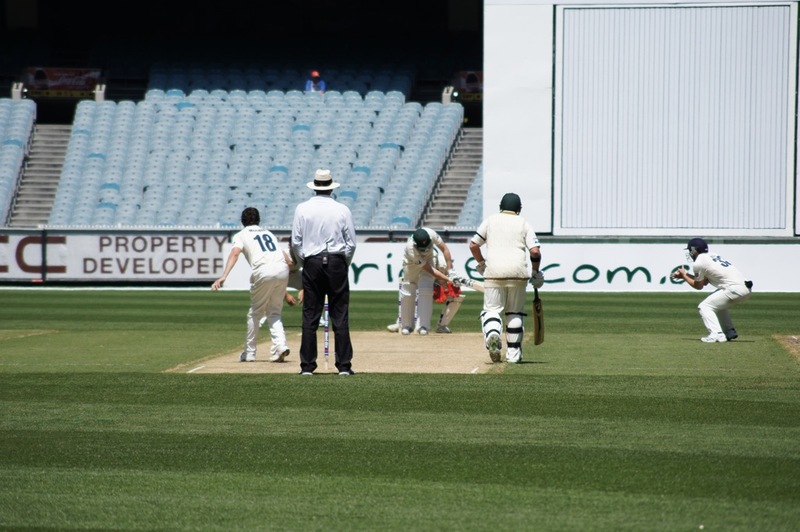 What the average punter wants, I suspect, and I’m putting myself in this category, is a sort of a hybrid first class comp…a short test match, like we used to play in our back yards – two innings each, unlimited overs, but finished quickly. The Sheffield Shield just isn’t doing that, but there is one comp that’s doing that, and that’s the district comp. They only play on the weekends, and they play attacking cricket, looking for an outcome, but there’s still the opportunity to bat for a long time if you’re good enough. Why not invest money in the district Cricket system and make it “first class Cricket”? It was interesting to note that when Michael Clarke was trying to prove his fitness for the Australian side, he went back to play with Wests in the Sydney comp. Of course, you would need some sort of premier league of all the best teams from the best district comps, but you could even introduce a promotion/relegation system to that as well…something like that could end up being the equivalent of the NZ provincial Rugby comp. Personally, I’d love to wander down to the Ken Mackay Oval and watch Toombul take on Sutherland. I’m loving the League’s idea of a hybrid “first class Cricket” competition. It leverages off one of the successful aspects of the Big Bash. Australians have traditionally followed clubs. Think about the NRL and the AFL. The Super 15 has States and Provinces but they are run as franchises so it has a ‘club like’ feel to it as well. When the IPL first started I loved the concept of following a team like the Kolkata Knight Riders but the IPL has made it difficult to follow as the teams have significant year on year turnover making it less accessible, especially if you aren’t from India. Replacing the Sheffield Shield Competition with a Premier League of Cricket Clubs would work if the points system encouraged results and they could attract some funding (that’s a big if). Coupled with relegation/promotion this could be the answer the ACB needs to further revitalise domestic Cricket. I know one thing. They need to do something about the Sheffield Shield. It isn’t paying its way. Black Caps showing plenty of ticker in the Second Test against Sri Lanka. Sporting declarations are back. As I mentioned earlier, one of the keys to the Dubs maintaining the rage was the maintenance of team chemistry by senior players like Andre Iguodala and David Lee willing to play different roles for the sake of the team. From what Steve Kerr is saying here it appears they are continuing to buy into that mantra. Pretty crucial piece of the puzzle. Ben Hamer (Leicester) for Eldin Jakupovic (Hull) – Reserve keepers don’t usually move the needle but I’m generally happy with my team. I wish my team scored more but I’m still happy with them. Forster (Southampton), Bertrand (Southampton), Ivanovic (Chelsea), Baines (Everton), Eriksen (Spurs), Downing (West Ham), Sanchez (Arsenal), Sigurdsson (Swansea), Kane (Spurs), Austin (QPR) and Diego Costa (Chelsea) with Hamer (Leicester), Sterling (Liverpool), Wasilewski (Leicester) and Wisdom (WBA) on the bench. BTW could I have picked a worse time to trade Nacer Chadli and bench Harry Kane? Who knew that the Spurs would bag 5 goals against Chelsea? Certainly not me. Now that I’m benching Raheem Sterling I’m pretty sure Liverpool will thunder 9 past Sunderland. This entry was tagged Australia, Cricket, England, EPL, Football, New Zealand, Soccer. Bookmark the permalink.